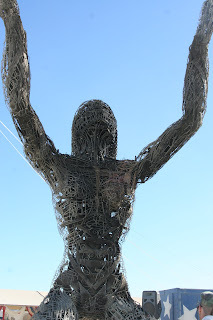 Morehead's Musings: Burning Man "Hot Academic Topic"
Interesting discussions. I was just doing some general searching on Burning Man and Christianity. I was interested in what was being said about that intersection out there. I was raised Christian and, at one time and for many years, was a devout believer. I no longer consider myself a believer, let alone a devout one, and my experiences with the Burning Man community have been a key element in that ongoing transformation. I am intrigued by the idea of a Temporary Autonomous Zone and the Burn is a place outside of the norms of life where expression in whatever form is embraced and celebrated. But it only has real power, real impact, when that experience positively impacts how we live day to day as it has me and many others that I know. It is perhaps true, that it is the church that is the secondary institution, and communities and events like Burning Man are actually closer to the truth than any established institution.